Maybe it was a happy accident. Maybe not. 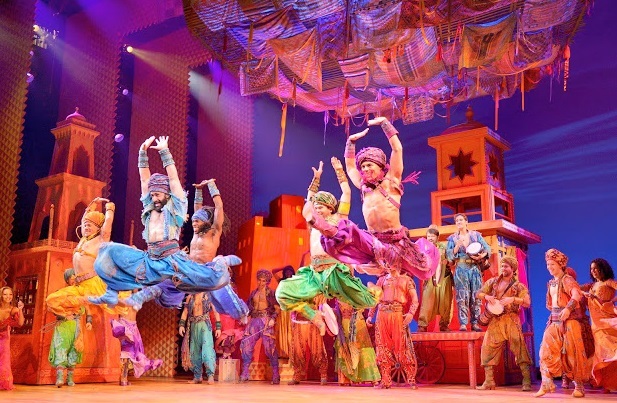 Following the success of Beauty and the Beast and The Lion King, the most recent Broadway musical to be adapted from a Disney animated feature is Aladdin, though its inspiration appears to come not so much from the film but from that cherished style of British musical comedy theatre, the pantomime, or panto as it’s more affectionately called. Largely unknown in America though occasionally referenced in this column, the panto has nothing to do with those French mime artists in white makeup pretending to be trapped inside an invisible box. It’s a beloved stylized form of theatre that emerges every Christmas season in towns, seaside resorts, and cities all over Britain. 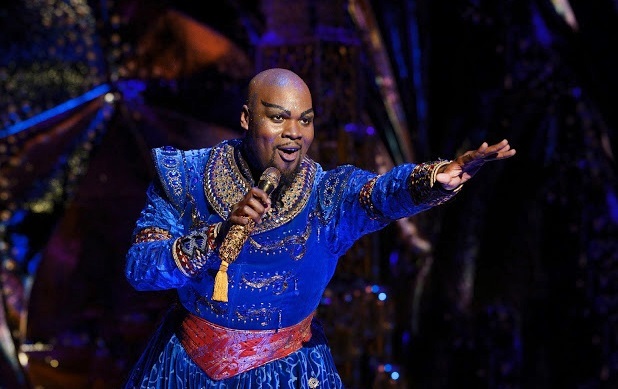 Fairy tales, principally Cinderella, Peter Pan, Babes in the Wood, and Aladdin are presented for the family in shows consisting of songs, slapstick comedy, puns, gags, sometimes topical, sometimes naughty in the tradition of a Benny Hill double-entendre, and nowadays often starring a known personality capitalizing on his or her TV soap opera career. American performers such as Henry Winkler, David Hasselhoff, and even Pamela Anderson have flown overseas at Christmas to appear as leads in a pantomime. No joke, Winkler’s Fonz as Captain Hook is said to be a classic. And one more thing. 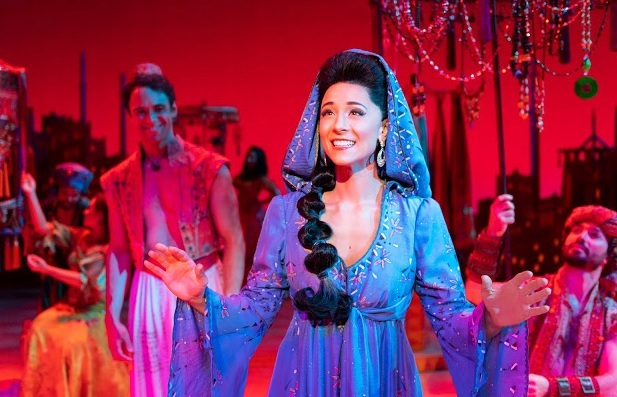 Audiences are encouraged to shout and respond to events on the stage. 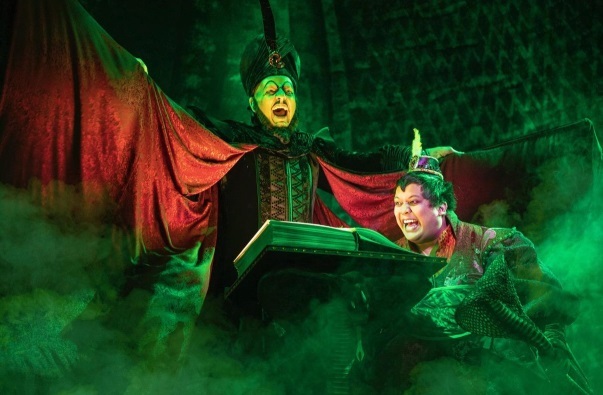 Villains are booed, heroes are cheered, and when a character is looking for someone who’s in hiding and asks the boys and girls in the audience if they’ve seen the missing person, they shout in unison, “He’s behind you!” And if a villain disagrees with a statement and says, “Oh, no it’s not,” everyone on cue without prompting shouts back, “Oh, yes it is!” Take my word, it’s glorious fun. 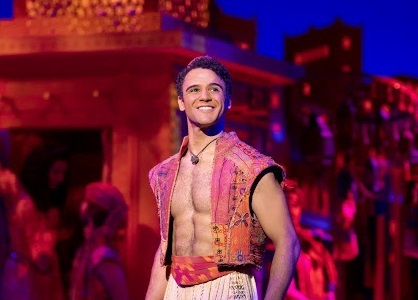 The tone of panto is established from the outset when the genie (on opening night played by Michael James Scott, but shared by three other performers on subsequent nights throughout its Tempe run) greets the audience declaring that the middle-eastern city of Agrabah has “More glitz and glamour than any other fictional city,” adding, “Even the poor people look fabulous.” And once he’s introduced the setting and the principal characters, he leaves the stage, ready to re-appear later to play his role in the story. “Try not to miss me too much,” he says as he exits. 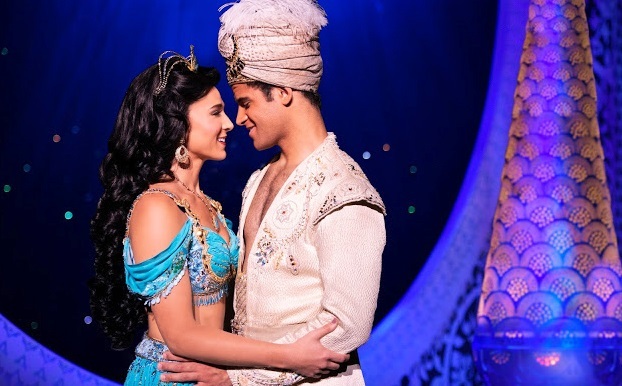 Songs that were cut from the film are added, along with some new ones, though it’s the genie’s spectacular Friend Like Me in the first act, with its glitter, theatrical magic, sparkling sets and costumes, and even A Chorus Line styled tap dance, that stops the show. 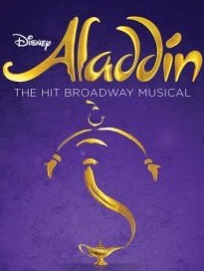 Other songs prove less memorable, though the second act gives us the FM friendly hit A Whole New World; yet even here it’s not the song that draws your focus, it’s Aladdin (Clinton Greenspan) and Jasmine floating around on a magic carpet against a sparkling Disney night sky, complete with shooting stars and a full moon that gets your attention. Rather than hearing the song you’ll be spending most of the time wondering how the scene was done and how come you can’t see the strings. When Jafar enters, you may find yourself suppressing the urge to either hiss or cry, “Boo!” And when the genie discovers he was tricked by Aladdin into giving a freebie magic wish and declares aloud, “Oh, no he didn’t!” don’t be surprised if some children nearby shout, “Oh, yes he did!” Aladdin is the most expensive and spectacular looking pantomime you’ll see without it officially being called a panto.